Is Mitt the one? For House speaker, that is! Mitt Romney in 2010. 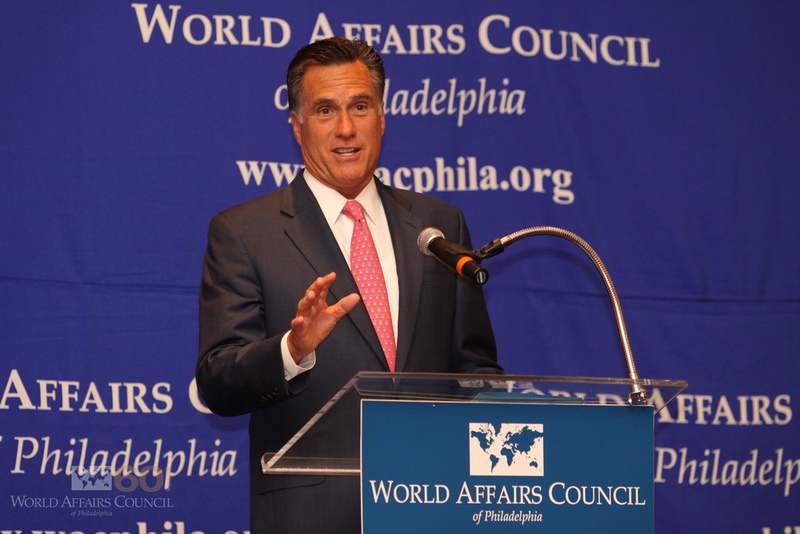 Photo (cc) by the World Affairs Council of Philadelphia. House Republicans appear to have reached their End of Days. David Brooks of The New York Times, a moderate conservative who at one time would have epitomized Establishment Republicanism, has analyzed the situation brilliantly. So has Gene Lyons, a liberal, at The National Memo. The immediate crisis is that the House of Representatives appears incapable of electing a speaker to succeed John Boehner. The problem is that Republicans on the extreme right vow not to respect the choice of the Republican caucus. That means no one will get a majority once the speakership comes to a full vote in the House, since nearly all of the Democrats will vote for their party’s leader, Nancy Pelosi. So I have an idea, and I thought I’d toss it out there. We’re already having a good discussion about it on Facebook. How about a moderate Republican who’s not currently a member of the House (yes, it’s allowed) and who would be supported by a majority of Republicans and Democrats. How about — as my friend Catherine Tumber suggested — Mitt Romney? Please understand that by “moderate” I mean moderate by the standards of 2015. Boehner may be the most conservative House speaker of modern times, but he’s a moderate by comparison with the right-wingers who are holding the House hostage. And so is Romney, who’d finally get the big job in Washington that he’s long lusted for. Under this scenario, the Republicans would necessarily pay a high price for their inability to govern. House rules would have to be changed to give the Democrats more of a voice and maybe even a few committee chairmanships. The idea is to form a coalition government that cuts out the extreme right wing. Not long after Tim Russert’s death, I realized that my aversion to George Stephanopoulos was not nearly as deep-seated as my aversion to David Gregory. So I switched from “Meet the Press” to “This Week” and haven’t looked back. Among other things, “This Week” regular George Will is a great entertainer, and where else other than the New York Times can you get a regular dose of Paul Krugman? Stephanopoulos, of course, decamped for morning television months ago, never to be seen again — at least not by me. Today, at long last, marked the much-anticipated debut of his permanent replacement, former CNN foreign correspondent Christiane Amanpour. I don’t think the occasion warrants a lot of analysis. But surely a little is in order. A few points. 1. I don’t watch “This Week”; rather, I listen to the podcast. So if there were any changes to the set, I wouldn’t know. For what it’s worth, I thought Amanpour, her guests and her panelists all sounded fine. 2. It was a good first week for Amanpour. She had two major gets, House Speaker Nancy Pelosi and Secretary of Defense Robert Gates. If Amanpour’s questions failed to elicit any major news, neither did she embarrass herself. In any event, with rare exceptions, top government officials are going to say what they’re going to say regardless of what they are asked. 3. Though “This Week” seemed pretty much the same as it always has, Amanpour did shake things up a bit, as Pakistani journalist Ahmed Rashid joined the roundtable from Spain. Over time, I’m hoping that Amanpour turns the entire format upside-down, eschewing political chit-chat for real substance. Perhaps this was one small step in that direction. 4. Jake Tapper deserves kudos for the way he handled “This Week” as a fill-in host the past several months. By taking a few chances (especially by embracing of New York University journalism professor Jay Rosen’s suggestion that he add fact-checking to the show), Tapper demonstrated that there’s still some life left in the old format. If, for some reason, Amanpour doesn’t work out, or if ABC News decides to use her elsewhere, then Tapper would be a natural — and I think viewers would accept him far more readily than they would have before his stint as a substitute.